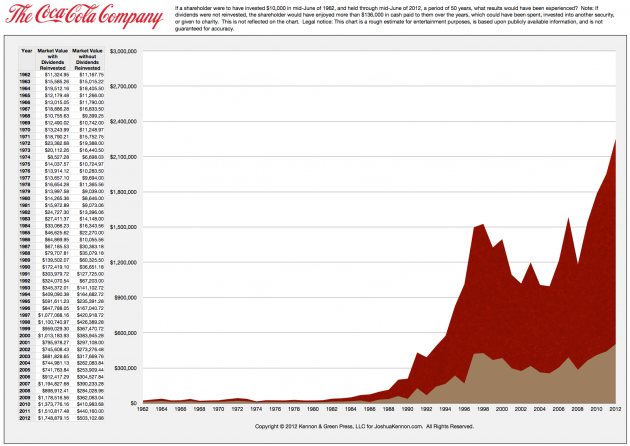 Last week, I posted on a 50-year investment history of shares of The Coca-Cola Company. As I was publishing this month’s About.com content, I began writing a piece that I called The Dividend Dilemma that focused on whether you should reinvest your dividends or not. 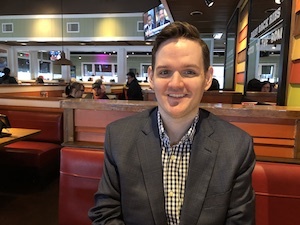 Around the same time, one of the readers, Matt Nix, asked about the difference dividend reinvestment would have made in the case of the Coke case study. My curiosity piqued, I spent my afternoon in my home study with a batch of fresh spreadsheets, half a century of publicly available Coca-Cola dividend and stock split information, and a calculator. 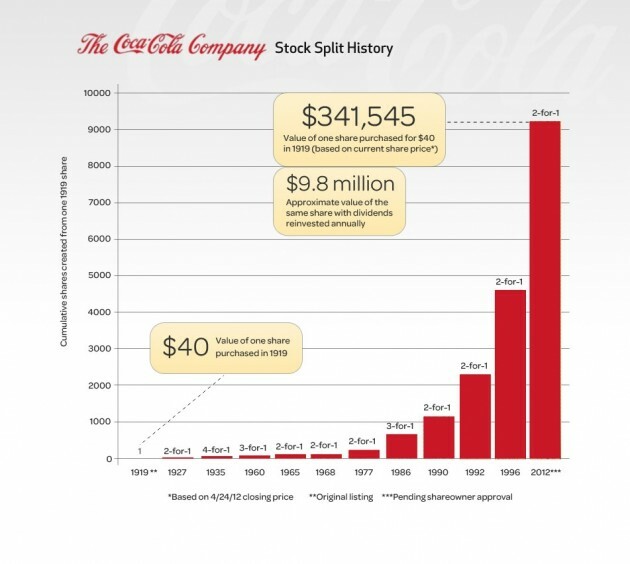 Click to Enlarge for Breakdown of Coca-Cola with Dividends Reinvested and without Dividends Reinvested from mid-1962 through mid-2012, a period covering 50 years, or an investment lifetime. This is the 95% complete rough draft image; a couple of the individual year-end data figures are off due to a formula copy error but the ending figures should be correct because I recalculated them several times by hand instead of relying on the spreadsheet formula. The short version, for the casual readers of the site: Imagine you had two identical investors, James and Thomas, both of whom bought $10,000 worth of Coca-Cola stock in mid-June 1962. James reinvests his dividends, Thomas does not. Thomas without Dividend Reinvestment. Thomas bought $10,000 worth of Coca-Cola in mid-June 1962. This resulted in 131 shares in his account. He ignored the stock. Over the past 50 years, he collected $136,270 in cash. That is more impressive than it appears because $1 in dividend income back in the 1960’s had significantly more purchasing power. Adjusting for inflation, the current dividend equivalent of the cash income he was paid is $193,350. On top of this, his 131 shares of Coca-Cola have grown into 6,288 shares of Coca-Cola with a market value of $503,103. James with Dividend Reinvestment. James bought $10,000 worth of Coca-Cola in mid-June 1962. This resulted in 131 shares in his account. He reinvested all of his dividends over the years. He never added to nor took away from the position over than those reinvested dividends. Today, James is sitting on 21,858 shares of Coke stock with a market value of nearly $1,750,000. His annual cash dividend income is nearly $22,000. Thomas received the inflation-adjusted equivalent of $193,350 in cash dividends along the way and is now sitting on $503,103 worth of the stock. Over 50 years, he turned his $76,000 purchasing power equivalent into $696,453. This is a real purchasing power gain of 941%. That means he turned every $1.00 he invested into $9.41 in purchasing power. Not bad. He also got to enjoy his money along the journey. James is now sitting on $1,750,000. Over 50 years, he turned his $76,000 purchasing power equivalent into $1,750,000. That is a real purchasing power increase of more than 2,300%. That means he turned every $1.00 he invested into $23.00 in real purchasing power. The down side is, he didn’t get to spend any of his capital along the way. He has to do it now, in his older age, or his heirs will do it when he dies. For now, we are ignoring the effects of taxes, which would be considerable. That is tolerable because, going forward, an investor could simply open a Roth IRA and take advantage of many of the free dividend reinvestment programs offered by the big discount brokers, most of whom do not charge a fee for the service.